A few years ago I purchased a used saddle with tapaderos or ‘hooded stirrups’. I had never used stirrups with tapadero coverings and was surprised how comfortable not to mention how stylish they were. The saddle was a little small for me so I covered it and used another. Recently, I moved on to an endurance saddle and decided to transfer the tapaderos from the old saddle. A woman once told me a trail ride horror story of a girl whose stirrup became tangled and caught in brush. The horse felt trapped and started bucking to get free sending the rider to a hard landing on the ground which broke a few of the girl’s ribs. One reason tapaderos were invented was to prevent this type of accident from happening. It wasn’t long before I realized that the tapaderos gave me a little more safety. I often rode down wooded trails with overgrown branches. When the trail narrowed and branches brushed past my leg the tapaderos prevented the underbrush from becoming intertwined in my stirrup. The tapaderos also prevented my foot from going completely through the stirrup. 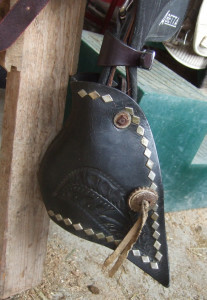 The rider’s universal fear of having a foot hung up in the stirrup when falling off their horse prompts many parents of young riders to insist on tapaderos. Personally, the mental image of being dragged, head bouncing along the ground was enough to keep my feet placed on the edge of the stirrups; tapaderos made it a no-brainer. Another advantage was extra warmth. The hooded stirrups gave my feet that extra warmth riders crave on winter outings. Working cowboys often lined the inside of their tapaderos with fleece for added protection against the cold. The idea made sense and someday soon I plan to make a lining for my hooded stirrups. Given the advantages tapaderos provide riders, you would think that more people would use them. Perhaps the reason for this is tapaderos are not allowed in most horse show classes and usually only seen on parade saddles. However for riding back roads and trails they certainly provide extra safety and comfort. 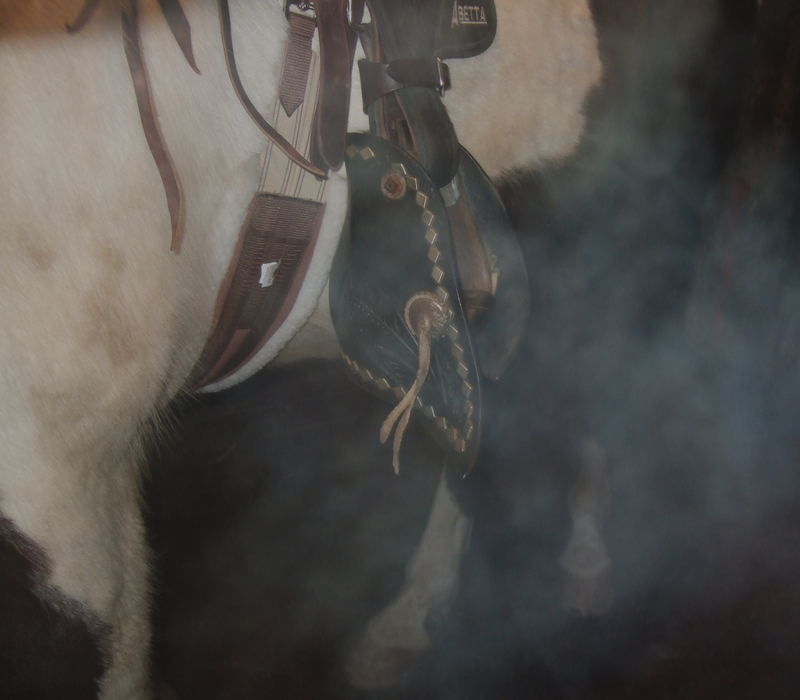 This entry was posted in Uncategorized and tagged hooded stirrups, horse safety tips, horseback riding, stirrups, tapaderos. Bookmark the permalink. Sad that shows would not allow them. It’s just a piece of leather. The riding and the horse should be judged first and foremost, not some small item of tack. I hope to get some hoods soon. I know they make things safer, but oddly whenever I’ve fallen, I never get a foot stuck. I think this is the case for people that stick their foot all the way into the stirrup instead of riding on the ball of your foot. I am interested in the safety it provides for brush though! Just hope I can find some nice looking ones. Hi J, It is sad they don’t allow them in shows as some tapaderos are really gorgeous. I think you are right about people who stick their foot too far into the stirrup and forget to ride on the ball of the foot. A fall can be very dangerous if the foot goes through the stirrup. I’ve been riding with mine for quite awhile now and really love them. Hope you find a pair that you love too.